To the workers of Fukushima. The first to intervene at the most terrible moments of the nuclear disaster. To their families and loved ones. This is a message of gratitude and sympathy from France. You may not be able to rely on your employers or your political leaders to treat you properly, but this doesn’t mean you are alone, iscredited, facing the hard to overcome problems you have to deal with. This may only be a meagre consolation to you, but many thousands of kilometers away, complete strangers, ordinary citizens like you are thinking of you and are grateful for your courage and your dedication. You are important people who deserve every respect, given the responsibilities you are constantly shouldering and what you are accomplishing, without recognition or reward. One can't blame the worker who unplugged the wrong pipe, pressed the wrong button or caused a tank to overflow, because of a lack of training, precise instructions and means of control. One can't blame the worker who falls into depression when he is confronted by difficult working conditions that endanger his health and his life? There are probably, throughout the world, thousands if not millions of people like us who are on your side and count on you, who offer you their trust and moral support, and who don’t forget you exist. We don’t know you personally, but like you, we are human beings and citizens of the Earth. We are aware of your difficult position, we cannot do much to help you, but we want to say thank you for what you do, thank you for the risks you are taking for us all. You have our heartfelt support. Thank you, "Fukushima 50" and all the brave people who from the very beginning of the disaster did not hesitate to risk their lives to prevent an even more dire situation. Thank you to all these people whose name will never get mentioned but who contribute each day to the colossal task of keeping the radioactive peril at the Fukushima plant in check. May our moral support and our thoughts reach you, your families, and the loved ones of the victims who have lost their health and their lives in this battle. The title of this article, "Full Tyvek Jacket", probably reminds something to many of you. This is not coincidence. Tyvek is a material made from non-woven polyethylene fibres, a fortuitous discovery of the DuPont company in the 1950s. 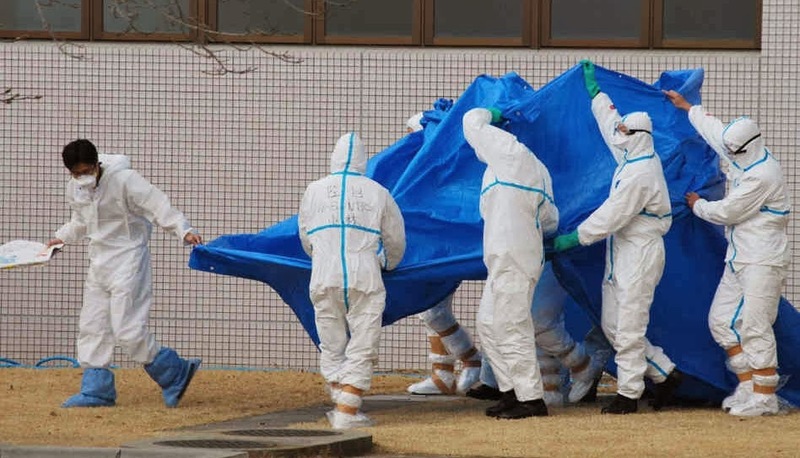 It is the constituent of white or sometimes blue protective suits, intended to be worn by all the workers involved on the Fukushima Daiichi site and decontamination sites in controled areas. 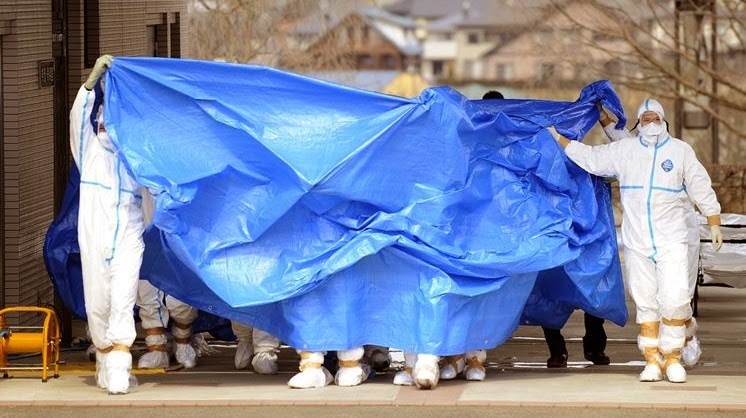 This type of combination is widely used in many industrial or craft activities as disposable protective clothing against dirt. For what concerns us, they therefore mainly protect workers from contamination by radioactive dust. But absolutely not against penetrating radiation, gamma rays or neutrons beams. 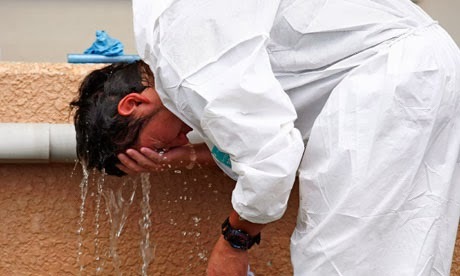 Against these risks you should have lead or tungsten based composites, used for example at Chernobyl or Fukushima, by some very exposed stakeholders during the cleaning work on the reactor 3 building. Russia Today recently published a short report on the conditions of workers in charge of the post-Fukushima rehabilitation work. Here it is with French subtittles. 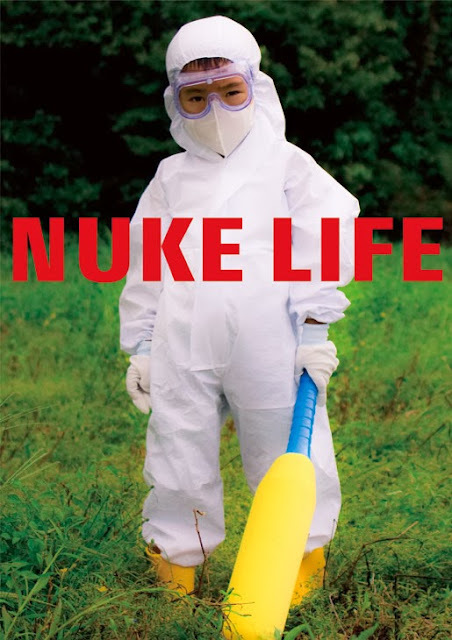 It includes Tomohiko Suzuki, the courageous investigative journalist who worked clandestinely in Fukushima for a month and a half during the summer of 2011, and has published a book titled "The Yakuza and the nuclear industry." 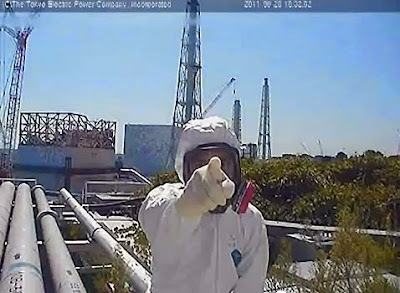 - The state of the plant, despite the official declaration of "cold shutdown," the risks to workers and the shortcomings of TEPCO and the Japanese government. - Involvement for many years of the Yakuza mafia organizations in the Japanese nuclear industry. 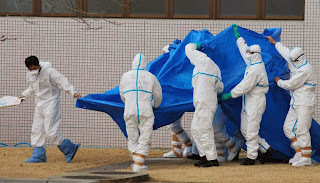 Here is a French video by BFMTV, published in March, 2013: "They are sometimes called liquidators, they are the workers at the Fukushima plant in Japan. Two years after the nuclear disaster, they are still likely to work on the site, in harsh conditions. In their white overalls, mask face, they are 3,600 working night and day to stabilize the damaged power plant. " "My parents who live a small town facing pacific in Hokkaido, Japan, once had an opportunity to host a homeless person in their house. He was looking for a one night shelter in the small town in Hokkaido with no money. The old man used to be working in various power plants in Japan and when he would reach his maximum annual dose of radiation he would leave the site and start travel around Japan. He ended up in Hokkaido at that time after working somewhere and found himself with no money. After one night he left for Aomori, the northern tip of Honshu island, with some money my father gave for train fare. I suppose many workers have been living like the man, working in various power plants sites in Japan since the very beginning of Japan's nuclear history. They are not the people who are rightly protected and well paid for their dangerous nature of the work. It is the shadow of the nuclear history of Japan and I am glad you mentioned about them in your blog! I just asks my mother who is now with us about the old guy they hosted. Apparently the man came to the local catholic church to look for a shelter, which means he knew very well that religious temples and churches were likely to give money or shelter for him. But people in the church didn't do so and called my father to deal with him (my parents are catholic). My father took him to the house and offered one night shelter, with dinner and drinks and bath. My mother says they have already hosted many people (mostly hitchhiker on the streets) at their place so didn't surprise her that time, too. My father is really a strange kind…. The man said that he had an apartment in Tokyo, but they didn't buy the story, as well as his claim that his money had been stolen. He would stay in one place and work, earn money, and hitchhike all around Japan. I think many construction workers are temporary sub contractors, and sometimes employers give food and shelter (of course they cost money, subtracted from the daily pay) for those in need. The man my parents hosted was probably one of those workers. Now I have seen some advertisement for recruiting workers and they are like 13,000 yen a day, but I don't think it it true. Workers usually have to pay for contractors fees, a bed and food, even for the health check ( I read it in the article I posted in the FB page). At last the money they receive should be much lower than the advertised. I remembered the story somehow because it happened after 3.11. It was kind of interesting". I think it would be unfair not to mention also those which are often early in the frontline of disasters, the firefighters, and the military. Certainly, they are more likely to chose their profession without being picked up in some shallows by the Yakuza. But whether in Ukraine or Japan, how many of them paid with their lives for their willingness to fight a battle in which they were not prepared, and brought relief to others? We'll never know, it's not in the interest of any government or authority to recognize and disclose exactly such kind of things when it comes to nuclear power. Here is also an American channel PBS documentary, "Inside Fukushima's meltdowns", in English, which pays tribute to these brave men. The English transcript is available following this link. 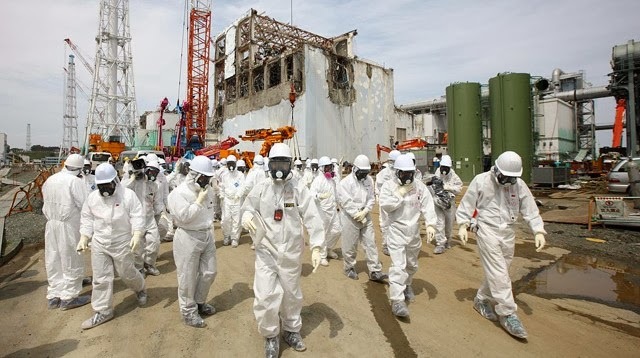 It seems difficult for me to finish this article, yet dedicated to the workers of Fukushima, without a mention to France. Can we think that in France, the situation of nuclear workers is better? In france, it's not the mafia that provides all-comers intermittent to nuclear industry. And here, no Fukushima-like disaster yet. But there is much more to say on the subject, which deserves a specific article. Here are just "The nuclear convicts", a photo-montage made ​​in August 2011, based on pictures by Vincent Capman. He also worked with men he photographed in Cattenom and Paluel French NPP in 2008 and 2009. He shared their lives, their workdays, their rest periods. To come back to the message for the workers, I would be very happy that other people or other groups took up this idea, and also express their support for those fighting on the battlefield of Fukushima, for all of us.Post this message on your website or blog, please contact us to translate it into other languages ​​and for inclusion in the list of participants. Write your own support message if you prefer, and distribute it as well. You can also write a traditional letter, here is the mailing address of the "rear base" of workers at J-Village. It features Japanese mention "To the Fukushima workers". The easiest way is probably to print it directly or stick it on the envelope. Don't forget that the majority of recipients only read Japanese. But there are drawings, symbols, which do not need to understand a foreign language. Please Check with your local post office for postage fees. Big thanks to all those without whom I couldn't have finally give life to this project. Thank you of course to the participants, which help spread this message, and I have been an indispensable aid among other translations. Thank you to Cathy, Janick, Pectine, Odile, SB, Akio, Georges Laurent, Pierre, Pierre R. Dandoy, Paolo, the team from Afaz site. I hope not to forget anyone, if that's the case, let me know.